WHEN IN EARLY ANTIQUITY Pao Hsi ruled the world, he looked upward and contemplated the images in the heavens; he looked downward and contemplated the patterns on the earth. He contemplated the markings of birds and beasts and the adaptations to the regions. He proceeded directly from himself and indirectly from objects. Then he invented the eight trigrams in order to enter into connection with the virtues of the light of the gods and to regulate the condition of all beings. The I Ching or the Book of Changes is the study of nature, its natural processes, and the study of human nature. Its teachings are based on observation of the natural world, of observing the flow of natural processes and time and taking those observations to human behavior, to learn beneficial ways of responding to situations. It is universal, speaking to all of humanity, yet at the same time, it is highly individualized as it is directed towards the one person who is consulting it. It is a personal questioning with a universal answer. Although its knowledge is directed towards the one individual consulting it, it is not for the individual alone. It is holistic. It’s basis is the interconnectedness of nature and man. Everything is connected to the earth and mankind as each one influences the other. The I Ching consists of 64 Hexagrams (consisting of 6 broken or unbroken lines), made by combining 2 trigrams (three broken or unbroken lines). Each Hexagram denotes an idea, for instance, the first hexagram Ch’ien – the Creative – Heaven, is a double trigram of Heaven – 3 unbroken lines repeated. The 2nd Hexagram, K’un – The Recpetive – Earth, is also a double trigram of Earth, 3 broken lines. There are 8 double hexagrams in the I Ching, while the other 56 hexagrams are a combination of Heaven, Earth, Thunder, Water, Mountain, Wind/Wood, Fire, and Lake. Thus it is a book that speaks in metaphors, using these very visual images to create ideas from the natural world that then interpret our day to day existence. These very visual concepts appealed to Janet Russek and David Scheinbaum, as they explored and learned the workings of the I Ching. 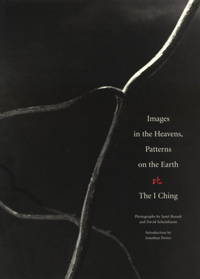 Images in the Heavens, Patterns on the Earth, the I Ching, Published by Museum of New Mexico.